Mary Longstreet: In Harper, there's nothing to be afraid of. Q: What is 'The Stranger' about? Q: Is 'The Stranger' based on a book? THE STRANGER offers an interesting story, but it takes its time in involving the viewer in it after a slow start. 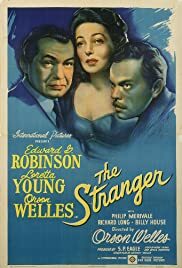 ORSON WELLES is an ex-Nazi hiding in a small Connecticut town and EDWARD G. ROBINSON is the man hunting him down. Loretta Young is his attractive wife who knows nothing about her husband's past. These elements are combined to make a fairly suspenseful story under Orson Welle's rather theatrical direction. He gives one of his robust over-the-top performances in the peak melodramatic moments, such as the final scenes where he follows his distraught wife to the clock tower, an ending foreshadowed by his fascination with clocks. Seen in a pristine print, it's a very watchable movie. Unfortunately, there are many Public Domain prints that make the film look like a low-budget production. Avoid them if you can, and you should get some suspenseful entertainment from a good print. Performances by Loretta Young and Edward G. Robinson are excellent.